Thunder Bay Beekeepers' Association – Beekeeping in Yemen. The small country of Yemen has recently been in the news. The quality of Yemen honey is known across the Arab world. The prized crop, the flowers of 'ilb' (Ziziphus spina Christi,) and 'sumar' (Acacia tortillas), is sold for $100 to $150 per kilo. 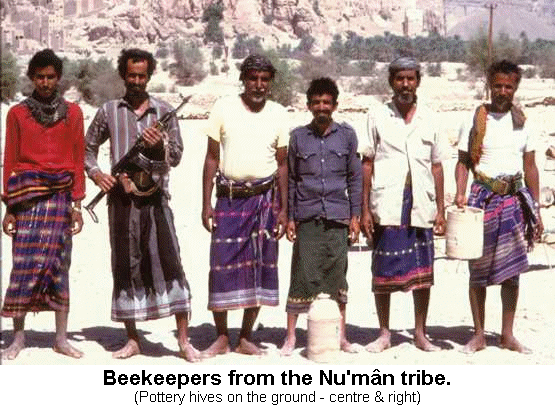 The quality of Yemeni honey has been known since pre-Islamic times. The exchange of honey was used to put a seal on the resolution of disputes and the creation of pacts between both tribesmen and tribes. The possession of honey of local production is a status symbol in modern-day Yemen, An offer of honey continues to have an important role when welcoming a guest. Honey is often served in banquets. 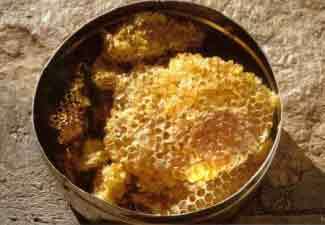 Honey and eggs are considered important for fertility and physical strength and therefore are given to young bridegrooms or circumcised boys. Yemeni tradition prescribes honey together with melted butter for consumption by mothers immediately after childbirth. It is widely used in folk medicine. For example, when mixed with myrrh it provides efficient relief from constipation, with carrot seeds it is an aphrodisiac, with hiltît (Asa fœtida) it facilitates menstruation, and with various plants it can be used against epilepsy.Connoisseurs are able to distinguish between a Yemeni honey and one imported from abroad, as well as recognizing its regional origin from the colour, aroma, and taste. The degree of the humidity and consequent viscosity are of great importance in the valuation of honey. A traditional test consists of letting a drop of honey fall into the dust. If it remains spherical, the honey is considered to be pure; if, on the other hand, it expands, it can be presumed either that the honey has been lengthened or that the bees have been fed with syrup. Interview: "My name is Mub�rak S. B., from the Nu'm�n tribe, whose territory is Wadi 'Amd. I am a beekeeper. 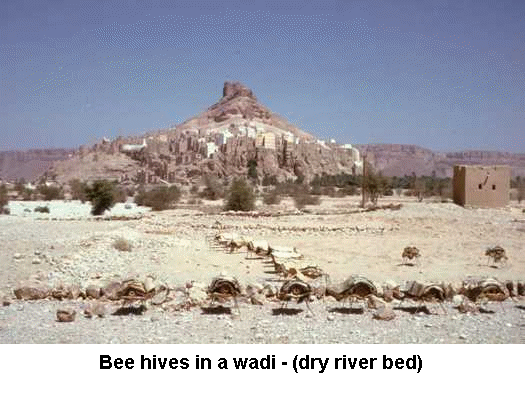 I move with the bees (n�b) using my pick-up wherever I go in Wadi Daw'an, where there is vegetation, where the rains have fallen, where there are plants. Winter honey is the best honey, of high quality, the most highly appreciated. But even now, in autumn, we bring the hives to the 'ilb trees. Bees harvest this tree, they take the honey for ten days or so. The resulting honey is pure, good, excellent, but the blossom ends before the honeycombs are filled." "We bring up the bees ourselves. We capture wild swarms in the mountains and the rest we buy at the annual bee market along Wadi Daw'an. Hives are made of clay. We buy them from people specialized in their construction. We buy the queen for 50 shillings. The bees have a queen... we know now that we are dealing with a queen, the queen of the bees, however we continue to call her 'father' (ab). We call the worker bees her sons ('iy�l ) or workers (shaghgh�l�n). The queen is bigger than her sons and workers." Traditional beekeeping uses small wood, woven cane or pottery hives, often on a metal stand, with the legs in cans of motor oil to deter ants. They are sealed at each extremity, leaving a few holes for the bees to pass. Both stationary beekeeping, with the hives placed either in the gardens or on the roofs of houses, and nomadic beekeeping are practiced. For nomads, a basic, long flat wooden hives are nowadays constructed, to give better stability when transported from wadi to wadi on pick-ups. 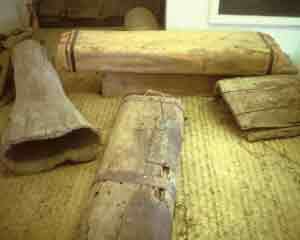 Modern hive-boxes, based on the same principle, are wooden, 80-100 cm long and 12 x 12 cm in cross-section. The front has a hinged door with a V-shaped bee entrance, and the rear closure is plugged and sealed with mud. Not long ago, camels were used, moving only at night in order to allow the bees to work during the day. Honey used to be carried in goat skins and conserved in pumpkins. When the combs are full of honey, they are cut out with a knife. A bit of honey is left in the hive as a provision for the bees in drier months. Hives numbers vary from those kept by families, with two to three hives, to those of professional beekeepers with up to a hundred units. 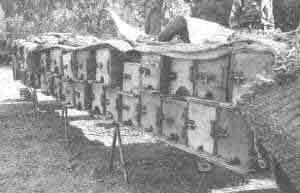 The techniques of beekeeping and honey extraction have remained, substantially the traditional ones, even if now modern methods and equipment are being introduced. 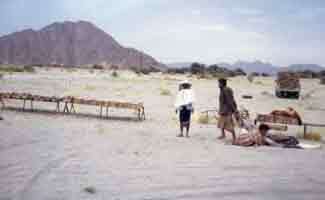 Migratory beekeepers - Hives are moved by truck and formerly by camel, to follow seasonal rains. In 2001, country-wide production was 150 tons. Copyright © 2009 Thunder Bay Beekeepers' Association. All rights reserved. Design based on Free CSS Templates by JRSservices.net.